They roam our streets and tend to the sick. People who describe themselves as real-life vampires have found ways to live quietly among us. "I'm not going to worry and waste sleep at night over who might think I'm a little kooky, because I think I'm a vampire," said Kiera, a registered nurse who works in a hospital in Atlanta. She did not want to be identified by her real name. Throughout the country and all over the world, a hidden subculture of people believe they are real vampires. They claim to have an "energy leak," which makes them feel sick and lethargic. To offset this energy imbalance, they say they need to feed on other people's energy or blood. "I try to be very ethical about what I do. I feed predominantly from crowds, so as not to cause harm," said Kiera, a founding member of the Atlanta Vampire Alliance. Kiera considers herself a "psychic" vampire. Other vampires known as "sanguinarians" or "blood-drinkers" claim to feed on the blood of consenting donors. Kiera said she has tried this before. "I have bitten people and had a very small taste of it, but I don't seek out blood donors to collect blood from and ... drink," she said. Doctors caution that ingesting or donating blood without the proper medical equipment is very dangerous, as it puts participants at risk for infectious diseases like HIV and hepatitis. In fiction from the classic novel, "Dracula" to the HBO hit series "True Blood," vampires are portrayed as immortal predators with supernatural powers. When they feed on human blood, they kill. Today's self-described vampires do not claim to be immortal or have superpowers. And they say they don't prey on strangers. They have willing donors, who often are friends or lovers. 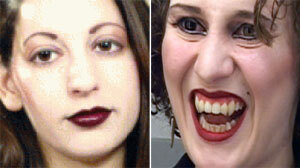 CLICK HERE to meet "real-life vampires" featured in the "20/20" piece. "Some people are misfits. Some people are just creative people who don't feel they fit into normal society," said Katherine Ramsland, professor of Forensic Psychology at DeSales University and author of "The Science of Vampires," who spent two years undercover investigating the vampire subculture. "Some people find the vampire a very empowering figure, and they want to identify with that." People who identify as vampires often meet at underground clubs, but "they're all over the place," said Ramsland. "I met people who were in professions, like attorneys, stockbrokers, jewelers, fashion models," she added. Being a vampire for Kiera is not a choice; she believes it's passed down genetically. Many say being honest about their "vampiric" nature can be a tricky balancing act. "My family and I have a 'don't ask don't tell' policy. They don't really want to know, and I'm OK with that," said a freelance writer and mother of two who calls herself Sylvere. She lives on a quiet street in Kansas City and says she doesn't really discuss her vampirism with her 8-year-old son, at least, not yet. "I probably won't sit him down and say, 'OK honey, look, I'm a vampire. You need to know.' It will be more if he asks, I will answer." Like Kiera, Sylvere, who likes to feed on creative energy, agreed to demonstrate her typical feeding. As her husband started painting, she began the feeding process in front of "20/20's" cameras. "I wait until he's so focused on his art that touching him is not much of a disturbance," she said. Sylvere put her hand on her husband's chest and bit him on the neck -- not hard enough to draw blood because she said she only needs the energy. "The more physical contact I can have with him, the easier it is to draw his energy. It's not sexual necessarily," she said, "but it will often lead to something of a sexual nature just because we do have such an intimate bond between us." Some self-described vampires have formed councils and associations through which they network with one another. They say they are convinced they are different from the normal humans they call "mundanes" and hope one day medical science will find out why.